A top round steak is lean, flavorful and it's budget-friendly. It is an excellent candidate for marinades, and it's at its best when cooked to medium rare, which is about 145 F. This is a great steak to grill but if it's not grill weather then you can get a similar effect by broiling it. Broiling exposes meat to a high heat from all directions. Your oven probably has a special setting just for broiling. 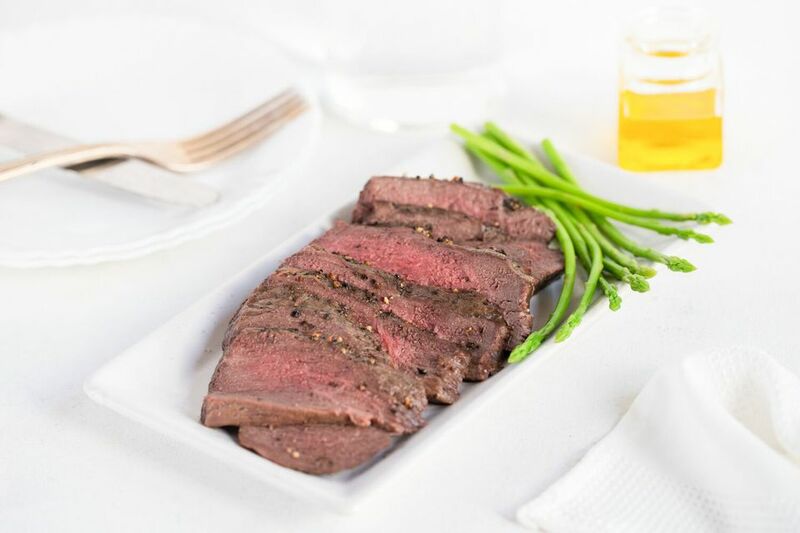 Broil this flavorful seasoned top round steak and slice it thinly for serving. This steak makes a great meal with baked potatoes and a tossed salad or steamed vegetables. Feel free to season the steak with some Montreal steak seasoning or another seasoning blend for beef. Or just add a sprinkling of garlic powder to the steak along with the salt and pepper. See the expert tips below the recipe for a simple marinade. You can also try rib steaks with garlic marinade or this recipe for pan-broiled steak with bourbon sauce. Check the steak with an instant-read thermometer to ensure the meat is done to your liking. Preheat the broiler for about 10 minutes and position the rack in the top portion of the oven so the steak will be approximately four inches from the heat source. In a small bowl, combine the olive oil, kosher salt, and coarsely ground black pepper. Rub the mixture all over the steak and place the steak on the oiled rack of a broiler pan. Place pan about three to four inches from heat source and broil for 10 to 12 minutes. Place steak on a cutting board. Slice the steak thinly and serve with baked potato and a salad, if desired. For medium-rare (145 F), broil a 1 1/2-inch top round steak for about 26 to 28 minutes. For medium (160 F), broil for about 28 to 30 minutes. Racks are used in broiling so that the food can heat evenly on all sides. If you don't have a broiler pan with a rack, you can achieve almost the same effect by flipping the steak halfway through cooking. Simple Marinade for Steak: In a bowl, combine 1/4 cup of balsamic vinegar, 3 tablespoons of Worcestershire sauce, 1/4 cup of soy sauce, 1/3 cup of olive oil, 3 cloves of garlic, minced, 1/4 teaspoon of ground black pepper, and 1 tablespoon of Dijon mustard. Put the steak in a food storage bag or bowl with the marinade ingredients and refrigerate for two to three hours.